Sunrisers Hyderabad 4-81 (Shikhar Dhawan 22, Darren Sammy 18*, Johan Botha 2-11) beat Delhi Daredevils 80 (Unmukt Chand 17, Irfan Pathan 13, Sammy 2-10) by six wickets. The strong batting line up of Delhi Daredevils relinquished against the deadly bowling attack of Sunrisers Hyderabad as the visiting team lost the match badly. Delhi Daredevils were bowled out for just 80 runs with five balls to spare and Sunrisers Hyderabad smashed 81 for the loss of four wickets in 13.5 overs. 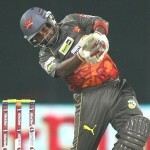 Darren Sammy (Sunrisers Hyderabad) was declared ‘Player of the match’ for his all round performance in the encounter. The 48th match of the Indian Premier League was played on Saturday, May 4, 2013, at Rajiv Gandhi International Stadium, Uppal, Hyderabad. Earlier, Mahela Jayawardene won the toss for Delhi Daredevils and came into bat with Virender Sehwag but the first was gone for 12. Sehwag struggled for 17 deliveries and scored just 8 runs when he was clean bowled by Darren Sammy. Unmukt Chand and David Warner found it difficult to steal the runs and crept to 50 in 10.5 overs. The stumps of Chand were uprooted by Dale Steyn for 17 and two runs later Warner was caught behind by Parthiv Patel off Amit Mishra for 8. 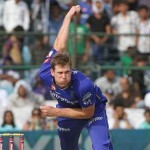 Delhi Daredevils were reeling at 5-57 in 12.2 overs as Jeevan Mendis and Irfan tried to put some runs on board. Mendis was caught by Ishant Sharma at long on at the bowling of Darren Sammy for 11. Irfan Pathan was the only other batsmen who entered the double figures by scoring 13 as the entire team was bundled out for mere 80 runs in 19.1 overs. Darren Sammy, Dale Steyn and Thisara Perera shared two wickets each whereas Ishant Sharma, Amit Mishra and Karan Sharma claimed one wicket each. Parthiv Patel and Shikhar Dhawan opened the innings for Sunrisers Hyderabad nicely by scoring 23 runs in the first three overs. Dhawan got 4 fours and Patel registered one boundary as the first was declared leg before wicket off Johan Botha for 22. Ashish Reddy went out cheaply for five runs and was replaced by Darren Sammy as Patel left his partner for 14 and the third wicket went down at 43 in 6.5 overs. Kumar Sangakkara joined in next with Sammy who was dropped at four by Warner off Mendis in the 9th over. Sangakkara became the next victim at 60 in 11.2 overs after scoring just 8 runs and the game was looking interesting at that point. Hanuma Vihari was the next batsman in who made no mistake along with Sammy and they kept on cruising towards the target. Sammy hit the first six of the innings in the 13th over whereas Vihari added a couple of fours in the next over as the score reached 81 with 37 balls still remaining. Darren Sammy remained unbeaten for 18 off 20 with 1 six and Hanuma Vihari was at the other end at 11. Johan Botha was the most successful bowler with two wickets and Ashish Nehra got one whereas no other bowler picked up any wicket. Sunrisers Hyderabad won the match convincingly by a big margin of six wickets and climbed up to the third position in the tournament with 14 points from the 11 games played so far.